We would like to invite you for the Dhamma talk by Ven Jinananda at Gotami Vihara, Cheras on Saturday 9 March 2019, 2pm. C ome to Ariya Vihara this Friday, 27 July 2018 to join the Bhikkhuni Vassa invitation. There will be light dinner provided at 6.30pm to 7.30pm. Dear sisters & brothers in the dhamma. Sukhihotu. Please find the attached poster of *3rd TSNP 2018 for launching on 31/8/2017, Thursday* which coincides with late chief’s 11th year of passing and 99th birth year; *at your Buddhist centres*. 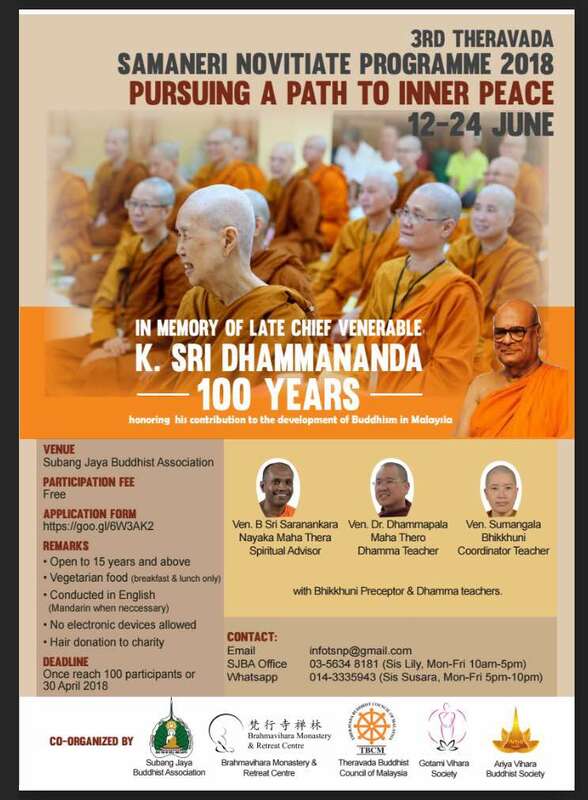 3rd Theravada Samaneri Novitiate Program 2018, 12 – 24 June at Subang Jaya Buddhist Association, Selangor.